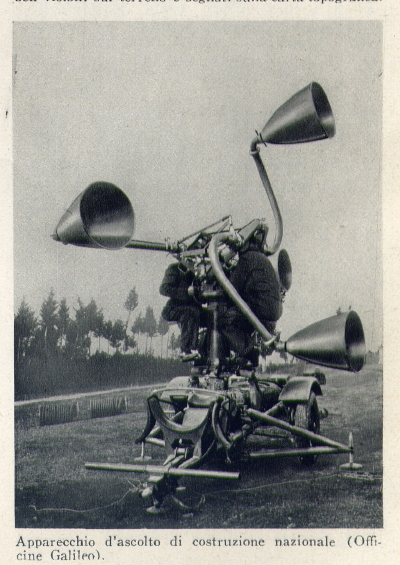 Among the other things, my father’s company used to produce giant aluminium cones which worked as special “ear trumpet” (see picture 1): they were mounted on carts, which could traverse and/or elevate, and used by usually two blind persons because of their bigger auditory sensitivity. According to the expectations of the technicians, these devices had to promptly detect the direction and the height of enemy’s airplanes and so to provide these data to the anti-aircraft. In 1944 on August, Florence was the battlefront between the Anglo-American troops that were moving forward to the North and the German and Salo’ Republic troops that were receding. Several fights were held within the city, on its streets, and Germans decided to destroy all urban bridges, but Ponte Vecchio, in order to slow down the arrival of Anglo-American troops. Yet, all the buildings near Ponte Vecchio, on both sides of the Arno river, were crushed to prevent its use. My father’s company was among those buildings (see the picture 2). So, his workshop was under the debris of the war. The only thing he and his employees could do was to recover all the materials and still-operating devices and to start again as soon as possible somewhere else in the city. The new head office was located at the suburbs of Florence. It was a small two floor building. Although the positive results of these tests, no orders were made. Together with the most important instruments made by Officine Panerai, the watch was shown at Naval Exhibition held in Genova in 1985 that was the last one organized in Italy. In that occasion, that was not open to the public and despite of the huge presence of Carabinieri and security men, the watch was stolen from the display cabinet. After an in-depth research the theft was denounced, but strangely on the last day of the exhibition the watch came out under the cabinet. For a few years the watch production was stopped; the only wrist devices that were produced were compasses and some kind of depth-gauges that were appreciated and requested by the special units of Italian and Foreign Army. On February of 2005, the legal head office moved to Prato. During the 2005, we reached an agreement with F.lli Elmi, owners of a small industrial group in Prato that produces high technology mechanics, from the engineering planning to the publishing of the technical manuals. The ENNEBI devices are mounted in their clean rooms. This collaboration reinforced our production capability and the maintenance of the high quality of our products thanks to their bigger availability of devices and qualified personnel. Jump to our watch or instrument galleries to have a look on all Ennebi products. All the instruments are made in small lots and they are followed step by step individually during the production process of manufacturing by means of machine tools. All the products have certificates of the origin of materials and components with production control cards and with a final test certificate. All this documentation is provided to the customer on request. On each instruments is engraved an identification number, a register number and the anti-falsification security code. The corresponding documentation presents the same numbers.